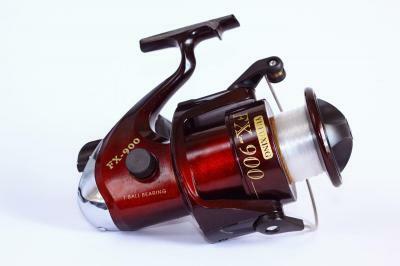 "Quality Fishing Gear at Affordable Prices"
GFUSA FX-900 JUMBO Reels ........ are made with high-quality non rusting materials that are critical for Saltwater Fishing where you require a JUMBO reel to accommodate stronger and longer fish line. FIRST ..... the crank handle is hinged allowing it to be stored in a closed position. This allows the reel to be stored in a car trunk, pick up truck, RV, or Boat with the crank handle in a closed position....out of the way, safe, protected, and non snagging on other items. SECOND ..... the Spool is removable. Just rotate the triangular lock ring on top of the spool then lift spool from the reel body............ an incredible attribute. Feature (1).............. all Saltwater fishermen and fisherwomen know the importance of rinsing the reel with Fresh Water after Saltwater fishing. Now with the Spool removed, it provides easy access to the interior of the reel body so as to assure a complete fresh water rinse thus providing longevity of fishing equipment. Feature (2).............. the spin cast reel is designed to accommodate from 10 lb test line up to 40 lb test line. Extra spools are available that permit the fisherman to have one spool with 10 lb test line; one spool with say 25 lb test line; and one spool say with 40 lb test line. If large fish are breaking the 10 lb test line >>>> "Pop out one Spool" and simply "Pop in another Spool" ............... in mere seconds. I am not aware of any other Spin Cast Reel on the Market that has this removable spool that provides these two unique features. Other: If used for Saltwater fishing, always rinse rod & reel with Freshwater after use. Be sure to order an Extra Spool that has FREE shipping with rod & reel combo purchase.